Marvel Character Dinner is a character meal restaurant in Marvel Super Hero Island at Universal's Islands of Adventure. Our readers say it's good but not great. 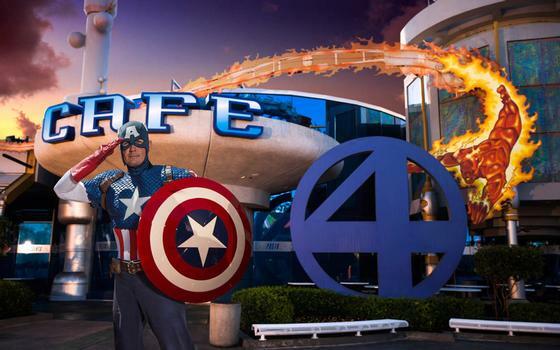 The character dinner runs from 5-7pm on Thursdays through Sundays at Cafe 4 in the Marvel Superhero Island land. Prices are $49.99 per adult and $24.99 for kids, ages 3-9. Dinner will be served buffet-style and will include Italian entrees, such as penne Bolognese, stuffed shells, and specialty pizzas, as well as shrimp scampi, chicken scallopini, and rosemary lemon chicken. The Marvel Character Dinner features appearances by Spider-Man, Captain America, Wolverine, Cyclops, Storm, and Rogue, who will visit each table for photos.